Omega-3 Fish Oil (from Fish), Cod Liver Oil (from Fish), Capsule Shell (Pharmaceutical Grade Gelatin, Glycerin, Orange Flavour), Vitamin E (D-Alpha-Tocopherol), Vitamin D (Cholecalciferol [Medium Chain Triglycerides, Antioxidant: DL-Alpha-Tocopherol]). Allergy Advice: For allergens, see ingredients in bold. TWO CAPSULES PER DAY, preferably with a meal and a drink such as milk or orange juice. Do not exceed the recommended intake. Food supplements must not replace a varied and balanced diet and a healthy lifestyle. As with other food supplements, seek professional advice before using if you are under medical supervision, pregnant, breast-feeding, suffer from food allergies, or are allergic to any of the ingredients. If you are taking oral anticoagulants (blood thinning medication) do not take these capsules except on the advice of a doctor. Allergy Advice: For allergens, see ingredients in bold. PROTECT FROM SUNLIGHT AND DIRECT HEAT. STORE BELOW 25°C IN A DRY PLACE, OUT OF SIGHT AND REACH OF CHILDREN. Is Ultra Fish Oils suitable for vegetarians? Why have Ultra Fish Oils been developed? What are Omega-3 EPA and DHA fatty acids? Why not just eat plenty of oily fish? How do you make Ultra Fish Oils so pure? How are you able to guarantee the purity of your oils? When are Ultra Fish Oils recommended? Can Ultra Fish Oils be used during pregnancy and breast-feeding? How many capsules does one pack of Ultra 2-in-1 contain? How and when should Ultra Fish Oils be taken? How should I store Ultra Fish Oils? How long does it take to experience any benefits? Can Ultra Fish Oils be taken with medicines simultaneously? 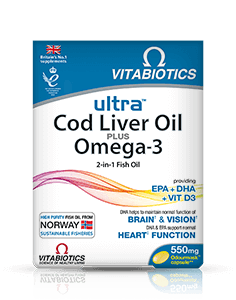 Is Ultra Fish Oils recommended with any other Vitabiotics' product(s)? Are there any undesired effects whilst taking Ultra Fish Oils? No, Ultra Fish Oils is not suitable for vegetarians as it contains fish oil in a pharmaceutical grade gelatin-capsule. Adults can obtain DHA and EPA indirectly through the conversion of the essential fatty acid Alpha-Linolenic acid (ALA), present in vegetable oils such as linseed but this process is very inefficient. Ultra 2-in-1 Capsules contains fish oil as it provides a much more reliable, direct source of DHA and EPA. Ultra Fish Oils is a range of fish oils designed to meet the highest quality standards required by Vitabiotic customers. These high-grade oils provide rich sources of the essential fatty acids, DHA (Docosahexaenoic acid) and EPA (Eicosapentaenoic acid) to help maintain all round wellbeing. DHA contributes to the maintenance of normal vision† and brain function . DHA & EPA contribute to the normal function of the heart‡. Omega-3 Docosahexaenoic Acid (DHA) and Eicosapentaenoic Acid (EPA) are essential polyunsaturated fatty acids because they cannot be made by the body efficiently and therefore must be obtained from the diet. These beneficial Omega-3 fatty acids can be found in fish. Eating a diet rich in Omega-3 fatty acids or by taking a supplement such as Vitabiotics' Ultra 2-in-1 Capsules, may help to safeguard the body’s requirement for Omega-3 fatty acids. Including oily fish in your diet, at least two portions a week is an important part of a well-balanced diet, and recommended by Government health officials. However concerns have been raised over the level of contaminants in some fish resulting from environmental pollution including heavy metals e.g. mercury as well as dioxins and PCB's (polychlorinated biphenyls). The fish used to produce Ultra Fish Oils only come from sustainable fisheries in highly regulated clean sea environments where contaminants in fish are at their lowest. Each batch of fish oil used in Ultra Fish Oils goes through the Opti-Pure purification process to ensure the oil is carefully refined and filtered. Each and every batch is rigorously tested and purity certified before it is allowed for sale to ensure our customers receive only the highest quality oil. Ultra Fish Oils are recommended for men, women and children as a nutritional safeguard. A general decline in oily fish consumption among the population means that most individuals would be advised to take a fish oil supplement to help support their health. The Omega-3 fatty acids and vitamins in Ultra Fish Oils are particularly helpful for individuals with concerns about their heart, brain and vision. Ultra Fish Oils contain Vitamin A (retinol), an excess of which may be harmful for pregnant women. During pregnancy, we recommend supplements specially formulated for this time, such as Vitabiotics’ Pregnacare® Plus - the original formula Pregnacare® tablets containing a careful combination of 19 vitamins and minerals, along with a specially formulated Omega-3 capsule for pregnancy (with 300mg DHA), designed for use from before conception, throughout pregnancy and whilst breastfeeding. Ultra 2-in-1 Capsules contains 60 capsules per pack. 2 capsules are recommended per day. Ultra 2-in-1 Capsules: Two capsules per day are recommended with a meal and a cold drink such as milk or orange juice to optimise absorption. To help prevent any aftertaste, Ultra Fish Oils capsules incorporate an orange flavoured odourmask shell. Do not exceed the recommended intake. The capsules are best stored at or below 25°C, protected from sunlight and direct heat. Keep out of sight and reach of children. Results vary amongst individuals, but in most cases we would expect the beneficial effects of Ultra Fish Oils to build over several weeks. There is no maximum length of time over which Ultra Fish Oils may be taken. A regular intake is recommended. Generally Ultra Fish Oils can be taken alongside medications. However, for specific advice on taking Ultra Fish Oils with medicines, we recommend that you contact your doctor or pharmacist first. Ultra Fish Oils can be used alongside the majority of Vitabiotics' products. Ultra Fish Oils has no known side-effects when taken as directed. As with other supplements, seek professional advice before using if you are pregnant, breastfeeding or suffer from food allergies, or are allergic to fish or fish products. If you have epilepsy or are taking oral anti-coagulants (blood thinners) consult your doctor or pharmacist before using this product. Vitabiotics avoids ‘mega dose’ levels of isolated nutrients and instead we have always stressed the importance of safe, moderate and sensible levels of vitamins and minerals, carefully balanced to maximise their combined effect; an approach which has been supported by many experts and researchers over the years.